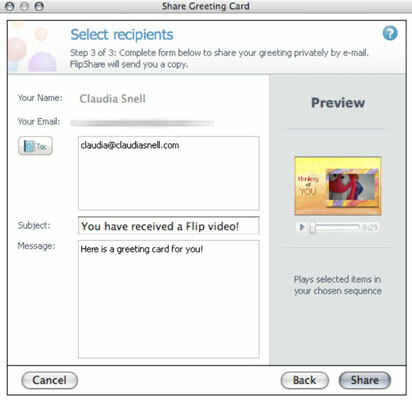 After creating videos and photos with your Flip camera, you can invite others to view your movies and pictures by sending your electronic invitation as a colorful greeting card custom tailored for a particular holiday or event. 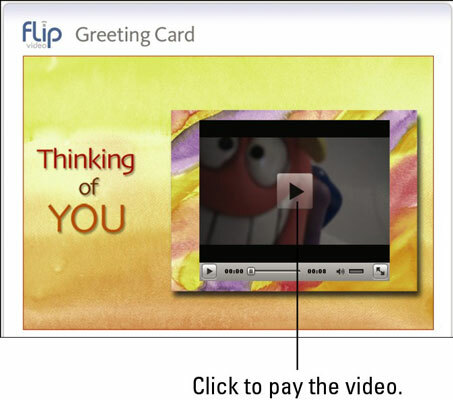 You do so by using one of FlipShare’s many greeting card choices. Greeting cards that aren’t tied to a particular event are also available. Click a video or picture item you want to send as a greeting card, and then click the Greeting Card icon on the Action bar. The Select Your Card window appears and displays a scrollable list of greeting card theme choices. From the Category drop-down menu, click a theme category. Categories include Love and Friendship, Thank You, or Others. The “Arrange Your Items” window appears, as shown below, displaying a thumbnail of your selected video or picture item (or items) on the left. On the right is a preview of your greeting card that you can watch by clicking the Play button to see how your card will look. Add: Drag and drop items from the workspace window to the left side of the Greeting Card window. 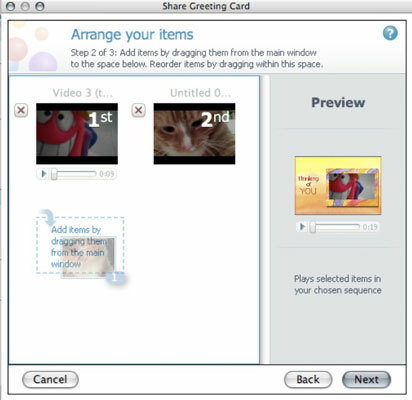 Rearrange: Drag and drop items in the left side of the Greeting Card window to rearrange the order in which the item will appear when the recipient watches the greeting card. Remove: Click the X to the left of an item to delete that item from your greeting card. Click Next to display the “Select Recipients” window and then fill in the text fields. The “Share Greeting Card” window closes, and a progress bar appears in the Progress box as FlipShare sends your e-mail message. Then you see an “Items Emailed” message, which lets you know when FlipShare successfully e-mailed your message. When you send a video or picture e-mail, FlipShare also sends a copy of your e-mail to the e-mail address you typed in for yourself. To see what your recipients will see when they open your invitation, open your message in your e-mail program. When you click the Click Here to Watch link, your Web browser automatically launches and opens a Web page showing your picture or video. Click the Play button to view your creation.